The New York Islanders were one of several teams to lose their captain this summer after John Tavares left for the Toronto Maple Leafs, but they’re no longer without a leader. The team today named Anders Lee as the 15th captain in team history, while announcing that Josh Bailey, Cal Clutterbuck and Andrew Ladd will serve as alternates this season. This announcement follows the news that the Islanders and Lee are discussing a long-term extension, and likely signals that a deal will happen before Lee becomes an unrestricted free agent at the end of the year. With the turnover the organization has had on the ice, behind the bench and in the front office, naming a player captain only to see him walk out the door a few months later would be tough to swallow. Lee, 28, has evolved into one of the best goal scorers in the league in recent years, recording 34 and 40 in the past two seasons. The big winger can do a little bit of everything on the ice, and should be able to ride shotgun with Mathew Barzal for many years at the front of the New York offense. There were few who saw this coming when Lee was selected in the sixth round in 2009, but his fall was more because of the competition he had faced playing in the Minnesota high school circuit than anything he’d done on the ice. Lee dominated in high school and kept that production going through his year in the USHL and a three-year career at Notre Dame, where he became one of the best forwards in the country. It’s hard to argue with this choice for the Islanders unless a contract isn’t reached, as Lee is an emotional leader on the ice and should be the one head coach Barry Trotz can lean on to spark his team. 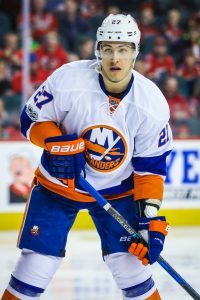 While Barzal may be the future superstar center for the Islanders, Lee will be asked to lead this team back to the playoffs and try to contend for the Stanley Cup. Ladd, a former captain himself, will be there along the way to help out along with Bailey and Clutterbuck who have been integral parts of the roster for years. Thomas Vanek is probably the most likely player to be traded from the Vancouver Canucks in the next few days, and yet there remains a chance he could re-sign with the team instead. Speaking with Iain MacIntyre of Sportsnet, Vanek explained he’d love to play another year with Daniel and Henrik Sedin, but they haven’t given him an answer about their future yet. Obviously, there is also the option of trading him this weekend only to re-sign him in the summer when he becomes a free agent. Vancouver already brought back Erik Gudbranson, their other top rental option, and don’t seem poised to really be big sellers at the deadline. Vanek brought in a third-round pick last season for the Detroit Red Wings, and could likely fetch a similar price if Vancouver decides to shop him around. After Josh Bailey was re-signed to a six-year contract this morning, many pointed out how it might help the New York Islanders re-sign his linemate John Tavares. The Islanders were making it clear that they wanted to keep this group together and were committed to winning. Not so fast, says John Shannon of Sportsnet, who tweets that the signing will “not have any effect” on the Tavares negotiations, and that the captain will still wait until after the season is over to make a decision. Auston Matthews suffered damage to his shoulder last night, and will be out for “a bit” according to head coach Mike Babcock. Chris Johnston of Sportsnet details how the Toronto Maple Leafs plan on dealing with the loss of their superstar center, and notes that the team will not change their approach to the trade deadline. The New York Islanders have some of the biggest names scheduled for free agency this summer, but now you can take one off the list. The team has reached a six-year extension with Josh Bailey that will carry an annual average value of $5.0MM. Bailey was ranked #6 in our midseason free agent power rankings, and has done nothing to justify moving him from that spot over the last month. The 28-year old forward is in the midst of an outstanding season, already setting his career-high in points with 62 through his first 57 contests. That includes 47 assists, good for fifth in the entire NHL behind only Jakub Voracek, Blake Wheeler, Johnny Gaudreau and Claude Giroux. His point total itself puts him among the top-20 in the NHL, and had been setting him up for a huge ask on the free agent market. The Islanders originally drafted Bailey ninth-overall back in 2008, but he didn’t quite break out until last season when he recorded 56 points. He’s become a perfect fit for John Tavares, the biggest fish that the Islanders are trying to get under contract before July 1st. They have to be hoping that retaining Bailey will help those contract negotiations when they begin in earnest, though we likely won’t get a read on that until the season is over. For the time being, Bailey will be happy with the substantial raise on his 2017-18 $3.3MM cap hit. He could be giving up a little bit of money, but will now get to stay with the only organization he’s ever known for the majority of his career. 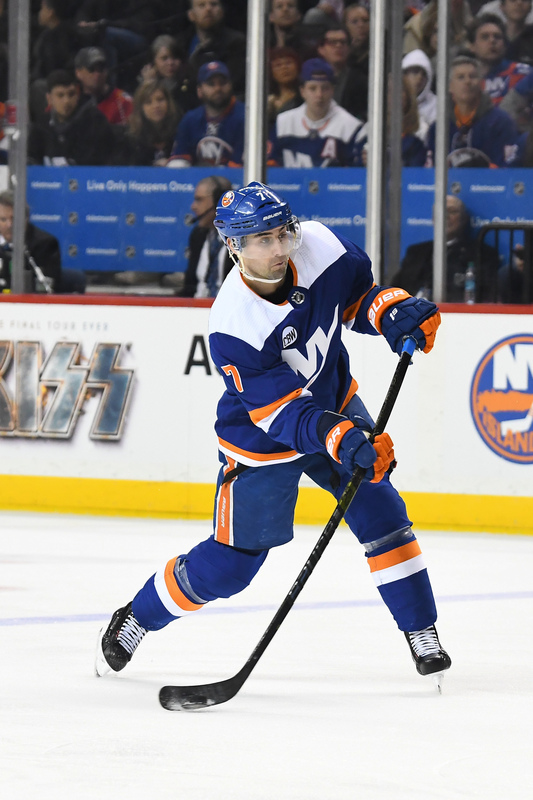 The Islanders will get an excellent playmaker for the foreseeable future, one that can likely find a home alongside Mathew Barzal if Tavares doesn’t stick around. Bob McKenzie of TSN was first to report a deal was close, giving us the salary parameters. Which Teams Would Have Flexibility In Another Expansion Draft? Midway-through the 2017-18 NHL season, it is nearly impossible to predict what rosters could look like following the 2019-20 season, more than two years away. Trades, free agency, and much more shape teams often in ways that no one sees coming. With that said, it seems like another Expansion Draft is coming to add the league’s 32nd team, the Seattle __________, and the timeline most are suggesting is a June 2020 draft date. Like it or not, the general managers of the other 31 NHL need to be keeping that in the back of their mind with each move they make over the next two seasons. Arizona Coyotes (0) – The only NMC players on the Coyotes are defensemen Alex Goligoski and Niklas Hjalmarsson. Hjalmarsson will be a free agent in the summer of the projected Expansion Draft and Goligoski’s clause will have shifted to a Modified No-Trade Clause. Arizona will likely have complete flexibility. Buffalo Sabres (0) – Kyle Okposo’s NMC expires after this season and Jason Pominville’s contract expires after next season. Buffalo won’t have any restrictions on their protection scheme as of now. Calgary Flames (0) – There is no one on the roster with a NMC and no one that will predictably get one by the end of the 2019-20 season. Kudos to GM Brad Treliving. Los Angeles Kings (0) – Kings’ captain Anze Kopitar in their only NMC player right now and even his clause will have shifted to No-Trade by 2020. L.A. is free and clear. Nashville Predators (0) – GM David Poile does not seem to be a fan of NMC’s in his recent long-term deals and in the new NHL expansion era, that’s a good thing. New York Islanders (0) – The Andrew Ladd and Johnny Boychuk contracts already look bad for the Isles. They would be much worse if their NMC’s didn’t expire soon. With John Tavares and Josh Bailey both candidates for NMC’s should they re-sign in New York and a defense that needs a re-haul, the Islanders could lose some flexibility, but they should be fine. Toronto Maple Leafs (0) – The Leafs have no NMC players under contract beyond 2019-20 right now. That could easily change with Auston Matthews, Mitch Marner, and William Nylander in need of extensions, but Toronto should still be in a good spot. After all, those are players that would protected regardless. Vancouver Canucks (0) – Loui Eriksson’s NMC shifts to a No-Trade Clause following this season and will be an afterthought by 2020. It’s fortunate, as Eriksson’s tenure in Vancouver has not gone according to plan. Vegas Golden Knights (0) – The Golden Knights didn’t sign or trade for any players with NMC’s and only drafted two – Marc-Andre Fleury and David Clarkson – who already had them and they both expire before the Knights would be set to become the NHL’s second-newest team. With that said, the current Knights’ roster will see a lot of turnover in the next two years and they may struggle to avoid NMC’s completely. Washington Capitals (0) – GM Brian MacLellan has avoided NMC’s in any of his recent mega-deals. If he can do it again this summer in his attempt to re-sign (or replace) John Carlson, then the Caps will be in good shape for another round of expansion drafting. Winnipeg Jets (0) – The NMC in Bryan Little’s contract will both kick in and expire between now and June 2020. The Jets should be left with a fully flexible lineup. Boston Bruins (2) – There’s little concern that Brad Marchand and Patrice Bergeron will still be playing at a high level in two years. Their NMC’s should be a non-factor for Boston. If David Krejci and, especially, David Backes still had their NMC’s too at that time, there would be a real logjam up front. However, both will have shifted to Modified No-Trade Clauses by then, potentially saving the Bruins from making tough decisions about their many talented young forwards. Carolina Hurricanes (1) – As important a job as he’s had in Carolina, Jordan Staal will never be the star forward that finally puts them over the top. If his NMC causes a problem in 2020, he could easily be traded to a contender to play a complementary role. The Hurricanes need to retain as many promising young forward assets as they can in hopes of one day finding that true superstar. Colorado Avalanche (1) – There are mixed opinions on Erik Johnson, but he has a leadership role for the Avalanche and will be key in grooming a strong crop of up-and-coming defensive prospects. The Avs won’t lose sleep about having to protect him in expansion, especially if he’s still one of their top-pairing guys in two years. Columbus Blue Jackets (1) – The Blue Jackets were one of the biggest losers in the most recent Expansion Draft. They might be smart to sell off Nick Foligno if there’s any risk that history repeats itself. Dallas Stars (3) – Call it optimism about his play in his first season in Dallas, but the NMC for Alexander Radulov doesn’t seem like it will be a major issue even after a couple more years. Of course, Jamie Benn’s NMC will also be a non-factor. Ben Bishop on the other hand may not be the goalie the Stars would prefer to keep in two years. As of now, there’s no immediate competition though. Detroit Red Wings (1) – Detroit only has one NMC player who will still be under contract in 2020-21 (and another season after that), but it’s Frans Nielsen, who has been a major disappointment for the team since coming over from the New York Islanders. He could throw a wrench in their plans if he continues his downward trend over the next two seasons. Minnesota Wild (2) – The Ryan Suter and Zach Parise mega-deals will still be making an impact in 2020, but with most of the core locked up throughout that season and no other NMC contract likely on their way, Minnesota should be okay in the Expansion Draft. Montreal Canadiens (2) – Even if the Canadiens continue to struggle through two more seasons, there will be few Habs fans that blame superstar goalie Carey Price. His NMC won’t be an issue because the team would never dream of leaving him exposed. Jeff Petry on the other hand could be a problem. Luckily (? ), it doesn’t look like Montreal will have many defenders worth protecting even in the next couple of seasons. Ottawa Senators (2) – Some things never change. The NMC’s for Bobby Ryan and Dion Phaneuf were problems for the Senators in this past Expansion Draft and they’ll likely be problems again next time around. If Phaneuf is traded between now and then, that alleviates some concern for Ottawa. Good luck moving the Ryan contract though. Philadelphia Flyers (1) – Only Claude Giroux has and predictably will have an NMC come June 2020. That’s a pretty safe situation for Philly. San Jose Sharks (1) – Marc-Edouard Vlasic plays a confident, stay-at-home defensive game that often ages nicely. He looks to be the only NMC in San Jose in 2020, which shouldn’t cause a stir. St. Louis Blues (1) – Patrik Berglund will be on the wrong side of 30 and still under a NMC when the potential 2020 draft rolls around, but with the rest of their core signed long-term without NMC’s, the Blues should be pretty safe. Tampa Bay Lightning (2) – Steven Stamkos and Victor Hedman may be the two safest NMC contracts in the NHL. Fortunately, Ryan Callahan’s otherwise-problematic NMC expires just prior to projected 2020 Expansion Draft. Anaheim Ducks (3) – Corey Perry, Ryan Getzlaf, and Ryan Kesler will all be 35+ and still be NMC-protected in 2020. That’s a large chunk of your protected forwards to dedicate to players in the twilight of their careers. Some up-and-coming young talent could leave Anaheim again in this next Expansion Draft a la Shea Theodore. Chicago Blackhawks (4) – The downside to signing all of your core players to long contracts with NMC’s could hit the Blackhawks hard in the next Expansion Draft. Patrick Kane and Jonathan Toews will be well past 30 and Brent Seabrook and Duncan Keith will be in their mid-to-late 30’s during the 2020-21 season, but all four will need to be protected ahead of that season, which could force other promising younger players out of Chicago’s protection scheme. At least they’ll narrowly avoid having an issue in net with Corey Crawford’s contract expiring prior. Edmonton Oilers (2) – Milan Lucic and Kris Russell. Each two years older than they are now. Those aren’t exactly players that a team wants to be forced to keep. It’s foreseeable that one or both could have a negative impact on the team’s protection plan. Florida Panthers (3) – The Panthers probably won’t mind having three players locked up come Expansion 2.0. The team knew what they were doing when they signed Keith Yandle long-term. Even in his mid-30’s, Yandle will be a reliable player and a leader for the young Florida defensive core. Sure, they considered asking him to waive his NMC this past June, but they never actually did. Yandle won’t be a major issue in two years unless his play falls off considerably. There should be no concern whatsoever over Jonathan Huberdeau and Aleksander Barkov, whose NMC’s kick in later on in their contracts. The same might not be true about Evgeni Dadonov, whose been somewhat underwhelming so far in Florida, but luckily his contract runs out just prior the probable draft date. New York Rangers (4) – Although they will have near total control over their forwards, outside of Mika Zibanejad, the Rangers could be in a tough position with their protection schemes in net and on the blue line in 2020. Then-38-year-old Henrik Lundqvist will require protection, as will underachieving defensemen Kevin Shattenkirk and Marc Staal. New York is apparently readying themselves for somewhat of a rebuild, which could mean some of those players are traded beforehand. Otherwise New York could face quite the dilemma. Pittsburgh Penguins (4) – It seems unlikely, even years from now and in their mid-30’s, that the NMC’s for Sidney Crosby, Evgeni Malkin, or Phil Kessel would cause trouble for the Penguins. Injury-prone defenseman Kris Letang could be different though. Being forced to protect him after another two seasons of hard minutes could be difficult to swallow. Pittsburgh also has some work to do filling out the forward corps between now and 2020. GM Jim Rutherford would be well-served to avoid acquiring or handing out any further NMC’s. With the All-Star game one day away, many NHL fans often get more excited for the 2018 GEICO NHL All-Star Skills Competition, which will be tonight. The NHL released the list of who will be participating in each of the six competitions with the winner of each receiving $25K. Enterprise NHL Fastest Skater – Each skater is timed for one full lap around the rink. Dunkin Donuts NHL Passing Challenge – Requires three skills over one round, including Target Passing (making four passes to a target that light up randomly), Give-and-Go (must complete four successful passes through a course in the neutral zone) and Mini Nets (must complete four passes over barricades and into mini-nets). GEICO NHL Save Streak – Goalies attempt to win by making the most consecutive saves against an opposing division on a minimum of nine shots. Gatorade NHL Puck Control Relay – A timed event that involves three skills, including Stickhandling (where a skater must control a puck through a series of eight pucks in a straight line), Cone Control (where a skater controls a puck through a series of eight cones in a zig-zag formation) and Gates (where a skater must shoot or choose to guide the puck through a lighted rung of a gate). PPG NHL Hardest Shot – Over two rounds, each player will attempt two shots measured in miles per hour with the highest speed recorded. Honda NHL Shooting Accuracy – A timed event in which a skater is positioned 25 feet behind the goal line and must shoot at five LED targets in the goal. A target will light up and the players has three seconds to hit it. While the Toronto Maple Leafs find themselves in an interesting cap situation in the future, the team seems to be content with making a playoff run and using their trade deadline assets in James van Riemsdyk, Tyler Bozak and Leo Komarov as “own rentals” instead. All three players will be unrestricted free agents next season and it seems unlikely that all three will be retained. While the team may be able to find a way to keep one or two of the free agents, there is a lot of speculation that the team is unlikely to be able to extend van Riemsdyk due to the scorer’s likely high contract demands this summer and their own cap situation, The Athletic’s James Mirtle (subscription required) asks the question whether it’s a good idea to lose the veteran wing for nothing. The in-depth story begins by looking at van Riemsdyk’s value as he currently has 19 goals in 47 goals and is on pace for one of his best seasons ever. Breaking down the numbers, Mirtle suggests that the team could easily afford the 28-year-old for the first two years of a deal, but complications will come after that when the team must start extending their young stars in Auston Matthews, William Nylander and Mitch Marner. That doesn’t even get to the thought the team might want to bring in a big-name defenseman at some point. No matter how you look at it, the scribe writes, there is no easy way to fix the problem. He writes the team should have moved van Riemsdyk a year ago to have gotten the true value they needed, but can’t move him now when the team is poised for a playoff run. It seems clear the team intends to invest elsewhere in the future and will have to fill the veteran’s place from within. Eric Engels of Sportsnet writes that Montreal Canadiens goaltender Carey Price said that he was suffering from chronic fatigue at the beginning of the season and couldn’t recover his energy after games and practices. “I was always tired,” Price told TVA Sports. “A guy who eats well and sleeps well like me isn’t supposed to be tired like I was.” After seeing a nutritionist, it turned out he had vitamin deficiencies in vitamin D and B12. Once taking supplements, Price said it took about three weeks before he began to see an improvement in his energy levels. Before being injured on Nov. 2, Price had a 3-7-1 record and a .877 save percentage. Newsday’s Arthur Staple writes that while the New York Islanders have made a number of moves, bringing up players from the Bridgeport Sound Tigers to help the team, many fans have noticed that prospect Joshua Ho-Sang has not been among them. That’s because, according to head coach Doug Weight, Ho-Sang is not trying very hard in the AHL. He was a healthy scratch with the AHL squad last week with finger-pointing towards his lack of effort. “It’s a crying shame he’s not playing with John Tavares when (Josh Bailey) goes down,” Weight said. “We had six guys out. It was a perfect opportunity. And Josh should be upset with himself. Whether our view of the world is wrong is something we can argue later. But the fact is, we need to be able to look at how some guys are laying it on the line [in Bridgeport] and he’s a healthy scratch. So to go from that to the first lineup here, where is he learning from that? That’s a big, big part of this.” Ho-Sang has five goals and 10 assists in 20 games with Bridgeport. With the halfway point of the season now behind us and the trade deadline fast approaching, it’s time to take a preliminary look at the UFA Class of 2018. Here is the first half of our top-20 rankings, based on votes from writers Gavin Lee, Brian La Rose, Nate Brown, Zach Leach and Holger Stolzenberg. We ran numbers 11-20 yesterday, and will release an honorable mention group tomorrow. 1. John Tavares, C, New York Islanders — There was never any doubt that Tavares would hold the top spot on this list, and he was ranked #1 on all five ballots. The superstar Islanders center will only be 27 on July 1st, and could challenge Connor McDavid for the largest cap hit in the league if a bidding war starts over his services. Even with all of his career success, Tavares may have not experienced a season quite like this one, as he is currently tied for second in league scoring with 54 points in 46 games. There is very little negative that can be said about him, and teams could legitimately change their franchise direction by landing the biggest fish on the market. 2. John Carlson, D, Washington Capitals — Though it’s a steep drop off after Tavares, Carlson is an elite free agent in his own right. It’s rare that a defender of his caliber hits the open market, and the fact that he only just turned 28 makes him a target for 31 teams in the NHL. Logging more than 26 minutes a night this season on a depleted Washington blueline, Carlson trails only John Klingberg in terms of scoring from defensemen with 35 points through 45 games. Though it’ll be a tough case to make at the end of the season, Carlson should get some Norris consideration and could land a huge long-term contract. 3. Evander Kane, F, Buffalo Sabres — Everyone’s favorite trade rumor is headed to free agency after the season, as the Sabres haven’t even approached him to discuss an extension. Unless he’s so enamored with his next team and signs a contract right away, he should be able to pick a landing spot from a dozen or more suitors in the offseason. How many years teams will offer him has been disputed at times, but at just 26 he’s one of the youngest free agents to hit the market and should provide several years of prime performance. 4. James van Riemsdyk, F, Toronto Maple Leafs — van Riemsdyk doesn’t carry the puck a ton, and doesn’t often score from far out, but might be the most dangerous scorer in the league within five feet of the net. He’s well on his way to another 30 goal season this year, even while playing the fewest average minutes since he was 21. Expected to ask for something around $36MM over six years, there will be no shortage of teams looking to add him to their powerplay. 5. James Neal, F, Vegas Golden Knights — Before this season, free agency or even the expansion draft, we looked at Neal’s incomparable consistency and how he was headed for a big contract on the open market. He’s never recorded fewer than 21 goals in a season, and already has 18 this year. Obviously a huge part of what the Vegas Golden Knights have done to start their franchise history, they’ll try to retain him on a reasonable deal. If they can’t, he might just end up scoring 20 for his fifth organization in 2018-19. 6. 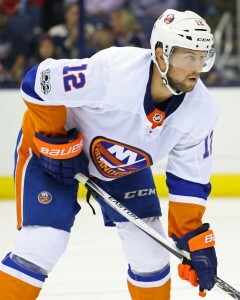 Josh Bailey, F, New York Islanders — It’s not just Tavares that the Islanders have to worry about leaving this summer, but Bailey (and de Haan below) too. He and Anders Lee have formed the perfect wing pair for Tavares this season, and Bailey is going to blow his career-high in points—set only last season—out of the water just at the right time. He’s 28, has 50 points in 42 games and is a lethal powerplay setup man. Who doesn’t want to add that on the open market? 7. Mikael Backlund, C, Calgary Flames — Maybe underrated because of his personality and lack of flash on the ice, Backlund is nevertheless one of the most valuable assets available this summer. Soon to be 29, he’s coming off back-to-back 20-goal seasons and is a legitimate long-term center option. Centers with 50-point upside and responsible defensive ability don’t hit the market that often, and Backlund should be able to cash in because of it. 8. Paul Stastny, C, St. Louis Blues — Speaking of centers, Stastny is in good position to cash in on one last multi-year contract. The 32-year old is still logging big minutes for the St. Louis Blues, and though he may not be the 70-point man of his youth is still an effective weapon at both ends of the rink. A decline is coming, but with 33 points through 47 games this season including 20 even-strength assists, he will still be able to command an audience on the first day of free agency. 9. Calvin de Haan, D, New York Islanders — That’s right, the third Islanders player in the top 10 is de Haan, who has steadily developed into an excellent all-around defenseman. While he doesn’t have the offensive upside of Carlson, his youth—he’ll turn 27 in May—and ability to plug into a top-4 will still have teams knocking down his door. Our writers had him placed everywhere from #7 to #16, but no one disagrees he’ll have plenty of options on the open market. 10. Mike Green, D, Detroit Red Wings — There was a time, nearly a decade ago, when Green was the shining example of an offensive defenseman. Two years in a row, starting in 2009, he finished second in Norris voting behind a more well-rounded player—first to Duncan Keith, then Zdeno Chara—despite point totals in the seventies. In 2008-09 he even recorded 31 goals, the highest total from a defenseman since Kevin Hatcher in 1992-93, and unmatched in the years since. At 32 years old he won’t be putting up 70 point seasons anymore, but is still an excellent puck mover and can quarterback a powerplay. He’ll likely be one of the stars of the trade deadline and free agent day.